(The business was sold to Mr. Brown in 1971). The shop was on Church Plain trading under the name of O.D. Hewitt, (Oscar Daniel Hewitt) was Gerald and Fred Hewitt’s father (he was also Landlord of the Cross Keys Public House from about 1900 - 1907). The shop was run by Oscar, being taken over by his wife and Jimmy Hewitt when he died on January 23rd 1919 at the early age of 49. Both Gerald and Fred worked in the shop and eventually took over the running. Another brother Bob was a tailor working in Dereham. The entrance was by a split door, sited on the side of the building, the bottom part kept shut to keep the dogs out. As you walked into the shop there was no counter, just a wooden block in the middle with two or three butchers walking round you cutting meat. It is said that there is a tunnel from the butchers to the church which is now bricked up and that possibly smuggling took place through it. This picture was taken about 1925 Hewitt Butchers is the building on the left. The cottage in the middle was demolished. There was a slaughter house at the top of the yard on the right hand side, where Mr. Pitts garage is now, with a blood hole - the blood being taken away each week. A lorry also used to call to take away the animal skins. A wooden hut used for storage stood in the yard until about 1972. Slaughtering took place until about 1955. Clifford Marsham from Swanton Morley was the slaughterman and also a butcher. The Hewitts used to buy bullocks from Norwich market which would be walked back to the village and then rested over the weekend. The main slaughter day was Monday so there was meat for the rest of the week. There was no means of refrigeration in the early days and the coolest place was high up in a tree, down a cellar or in a basket down a well. They used dry ice into which the meat was packed. A refrigerator was installed when electricity came to the village in 1935. The cellar in the shop would keep the same temperature summer and winter. In winter, when it was not in use for meat storage, dahlia tubers, apples etc. would be stored down there. There was only one tap supplying cold water situated on the end wall between Hills yard and the shop. A copper was used to heat water for scrubbing down etc. or if you were lucky the baker would have hot water left over when he had finished baking and this could be fetched. Beef and pork sausages were made and Fred Hewitt used to make pork cheeses in the building up the yard. A big boiler with an open fire would be used to cook the meat and jelly ready for it to be turned into the pork cheeses. Chickens and rabbits were very rarely sold as country people kept their own. The delivery rounds consisted of about 600 - 700 calls made by trade bicycle or van. Yaxham was a big round, probably about 90 - 100 calls and this round would get three deliveries a week, Tuesday, Thursday and Saturday. People would have meat delivered one day to be eaten the next - houses had no fridges in which to keep meat etc. Many cottages had wire safes for meat storage to keep flies away. There used to be a cooling fan on top of the van to keep the meat cold, when the wind blew the fan used to hum loudly and would sound like an aeroplane. On one occasion the fan came off the roof and flew across a field. Another time one of the front wheels came off the van and went bowling up the road ahead of the van. The meat was delivered with a ticket attached stating price and weight of the cut which was the law. It was not unknown for the weights and measures people to stop the delivery van on the road and weigh everything being carried. In those days it was not uncommon for the housewife to have the same cut of meat delivered on the same day each week (e.g. mince on Tuesday, liver on Thursday). People would either have monthly or weekly accounts. If they paid weekly they were probably a week behind as the husband was probably paid on a Saturday so payment was made the following Monday or at the end of that week. During the war there were problems with rationing. It was not unusual for half a bullock’s head to be booked up weeks in advance and the allocated six pound tins of corned beef had to be distributed fairly. In the early days when Brian worked at the shop after school in the 1950s time meant nothing. As soon as he came out of school he would come to the shop to help scrub up, then they would go off on the North Tuddenham round at about 6.00 p.m. - Brian’s bicycle tied to the side of the van - an old Morris Commercial. There would then follow two to three hours of deliveries. Gerald the older brother was a keen sportsman who loved darts and cricket. He was also a sidesman at Burgh Church. He was a member of the Fire Brigade based at South Green during the second world war and they used to go to Norwich a lot during the blitz. They had a car which towed a trailer pump and used to say that it was quite frightening going along Dereham Road. Fred Hewitt lived in the flat at the shop until the Four-Ten in Mill Street was built about 1962-64 on land next to the orchard that went with the shop. Gerald lived at Almond House in South Green until he had a bungalow built next door to Fred in Mill Street. Gerald used to smoke a pipe and on one occasion while travelling to Dereham he put his pipe in the front pocket of his apron and before long smoke started drifting up. He was giving Mr. Buskall (who lived in the old cottage next to the shop which was demolished in about 1969) a lift at the time and he considered it was nothing to worry about until Gerald mentioned the pocket also contained 12 bore cartridges. Mr. Buskall’s exit from the van was extremely swift. Some months later Gerald called on Mr. Buskall (who was always saying he would do away with himself) and found that he had hung himself from the banister in the old cottage. George Girling started work for the Hewitts in October 1954, when he left the forces, and worked there for 33 years. At the time he started in 1954 only pigs were slaughtered, about 5 a week. 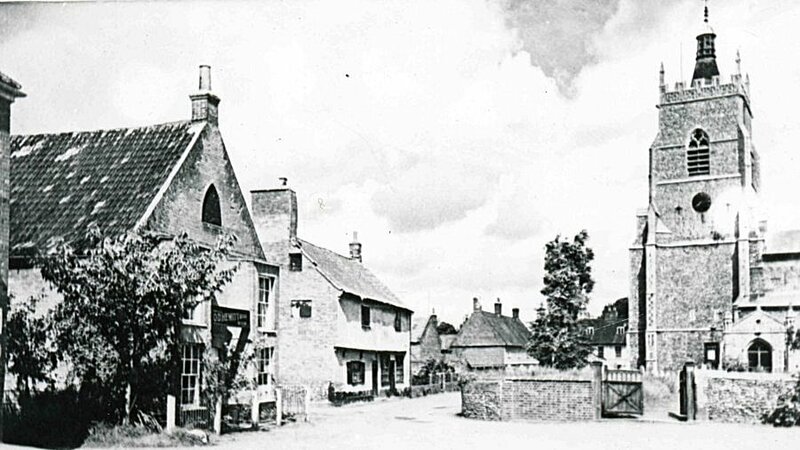 George did delivery rounds in Hockering, Honingham, North and East Tuddenham, Barnham Broom, Brandon Parva and Coston in a van or with a trade bicycle. The Hewitt brothers were considered to be very good employers, they paid the going rate. In the early 1950s the weekly pay for a part time shop lad was 15 shillings which covered five nights and a Saturday morning and they were always happy to give time off if needed.